In Colorado, water is one of our most precious natural resources we have, unfortunately it is also the most wasted. Guess where most households use it the most… about 50% is from watering the lawn. For that reason, we have seen Colorado residents searching for water conservation methods that will reduce the amount of water they are using. 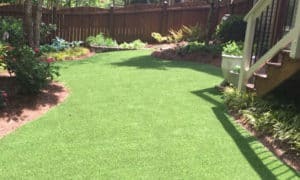 When Artificial grass is installed it conserves approximately 40 gallons of water per square foot per year through the elimination water used through household irrigation systems. Even in smaller towns, this is a savings of millions of gallons of water! According to Colorado State EDU, the average Coloradan uses 250 gallons per day, half of which half of that goes to watering the lawn. For more on Colorado water usage facts, Click Here. 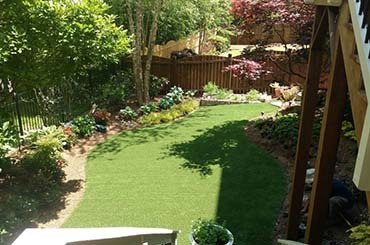 To start you will have a gorgeous, natural-looking artificial grass lawn that will be the envy of your neighborhood. A beautiful lawn all year round, even under large trees and around flower beds that need watering. All of our turf products are durable, low maintenance, water conserving, and mud free, solving many of the problems homeowners face with their natural grass lawns. Save Money. It will reduce your water bill significantly because you no longer have to water your lawn. Low Maintenance. As mentioned above, no more mowing the lawn, adding fertilizer, weed killers, just relax and enjoy your day. Since synthetic turf doesn’t require water, you can allow any planting you do to dictate your watering schedule. Water efficiently, you can set each water zone to the right amount of water your plants need. ProGreen artificial grass eliminates gas-powered mowers, trimmers and aeration, any dependence on oil, and reduces the chance for any gas and oil spills. In addition, ProGreen grass doesn’t require fertilizers or toxic anti-weed chemicals, which often seep into the water supply due to run-off . Therefore reducing the chance of causing any groundwater contamination. Made in the USA! ProGreen has been producing and installing synthetic grass from start to finish in their own facilities in the USA for 30 years. We chose to be a dealer for them because of it’s high quality, durability and reliability and because it truly is one of the best water conservation methods for our customers to use year round. If conserving water is important to you and saving on your water bill, then Progreen artificial grass is the perfect choice. To get a quote, either call us directly at (303) 829-3374. Or Click Here to email us.